DAYZERS LOTTO-Wheel E-game held on 13th April,2009. by email or call for processing and remittance of your prize money to you. the use of MS WORD. Subject: CLAIMS PROCESS FROM DAYZERS LOTTERY. Thank you for contacting us at the Due Process Unit. We are assigned to render advice and assistance in line with your winning claim process.DEDAYZERS LOTTERY HEADQUARTERShas finally conducted E-game lottery for 2009, our aim was developed and designed to satisfy the cravings of the ever-growing20number of participants in our various E-games lottery programs. We wish to congratulate you and formally inform you that you have won the sum of 1.500, 000.00 Euros (One Million Five Hundred Thousand Euros) in the last email-lottery draw, organized here in theNetherlands. You are required to forward the following details to help facilitate the processing of your certificate and the release of your winning prize. 8. Phone number and fax number. 9. Winning Reference number and coupon number. 10.A scanned identification of you sent via email or via fax for vetting process which is a standard practice just to ensure that we are dealing with the right individual. You are advised to forward these information as soon as possible to enable us process your winnings. Please note that your winning prize is in a suspense account and you will be paid after completion of the due processing. After the verification exercise your information will be forwarded to the payment Bank for the immediate release of your prize money. After due processing has been done, a Certificate of winning will be presented to you. The certificate stands as proof of source of the funds. This process is vital and urgent following the instruction from our Payment center that all prize money should be claimed as soon as possible. As soon as you forward all necessary information requested, we shall give you a call. Once again accept our congratulations and we look forward to hearing from you soon. You are free to call us on.Tel: 0031-624-874-226 if you have any questions. Subject: CONTACT THE PAYING BANK FOR YOUR FUNDS TRANSFER. We acknowledge the receipt of your information. On behalf of the entire staff and management we wish you congratulations for being one of our lucky winners in the last email draw held here in the Netherlands. Since you are non residence, your transfer is going to be a telegraphic wire transfer from our paying bank here in the Netherlands to your own designated bank account. Note that funds lodged in suspense account are NON-DEDUCTIBLE until it has been transferred to your operative account; You are therefore advice to contact the paying bank for further instructions on how to claim your winning prize. I will advise you contact the paying Bank and you will be instructed on how to secure an account for online transfer. Congratulations once again and endeavour to keep us updated prior to your correspondence with the paying bank. 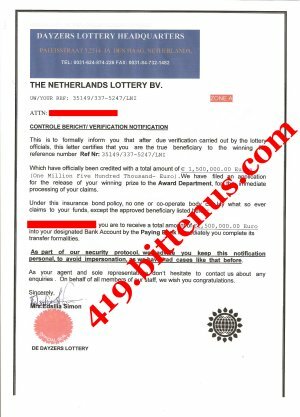 Sequel to the telex confirmation message received from DAYZERS LOTTERY, please be informed that this office is in receipt of your Winning Bonded deposited sum valued at €1, 500,000.00 (One Million Five Hundred Thousand Euros Only) following the order from DAYZERS LOTTERY. We have been given the mandate / instruction to effect the release of the above mentioned via our Online Banking System through which means the deposited funds will be transferred into your nominated bank account. We wish to inform you that your payment file as submitted to this is being looked into and processed for the prompt remittance of your entitlement without further delay. You will be dully communicated with the online account log in details as soon as the verification / processing exercise is concluded shortly. 3. Your telephone and fax numbers for ease of communication. for the purpose of proper identification and records.